Nothing can spread holiday cheer quite like a vibrant and festive poinsettia. 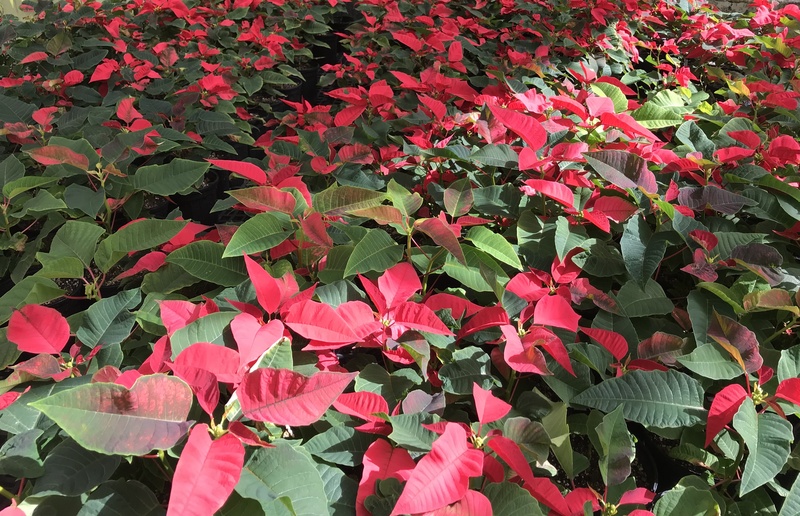 Poinsettias grown by students in FIU’s Agroecology Program are on sale through Dec. 11. The annual sale marks the culmination of a semester-long project in the Introduction to Horticulture Science course and lab, which takes them through the process of planting, cultivating and selling crops. They are grown in FIU’s Wertheim Conservatory and tended to by the Garden Club. A holiday classic, poinsettias are ideal for anyone who needs to decorate or give a gift. Each plant is $4. They may be ordered by email at agroecol@fiu.edu, or by phone at 305-348-0186, and picked up at the Modesto A. Maidique Campus. With the proper care, a carefully selected poinsettia plant can remain attractive for eight weeks throughout the holidays and live for more than two years. FIU Horticulture Instructor Amir Khoddamzadeh offers insight for how to care of a poinsettia in the home. Light: Poinsettias need at least six hours of direct natural or artificial light every day. Temperature: Poinsettias should be kept in temperatures ranging from 60 to 70 degrees Fahrenheit. This helps their bracts retain a bright, red hue. Avoid excessive cold and heat from open doors, cooling and heating ducts, lamps and other appliances. Moisture: Poinsettias like a moist environment. If the room is dry, a humidifier or plant mister can help keep them hydrated. Homeowners can also display the poinsettias with other house plants since plants in close proximity to each other raise humidity levels. Water: Poinsettias also like moist soil. When soil becomes dry, add room temperature water. Don’t water the plant too often, though. Too much water can cause the poinsettia’s roots to suffocate and leaves to wilt, yellow and drop. After watering, make sure a small amount of water drips through the drainage holes in the container. If the poinsettia is wrapped with decorative foil, punch holes in the foil so excess water can escape. Khoddamzadeh says poinsettias are not poisonous, but some people and pets may be sensitive or allergic to their sap and could develop a rash when exposed to it. If this happens, the affected area should be washed with water and soap. If a severe reaction occurs, immediate medical help should be sought.